With the increasing use of the internet, digital marketing becomes increasingly important. And with its increasing importance, we see different terms every day. One of them is the “T-shaped Marketer”. We have seen several articles from Moz to Distilled related to this term bringing out a “model” based on the talents and skills of the marketers. Although we hear it very frequently in recent years, it has been used mainly in consultancy and technical areas since 1990. Companies like McKinsey and IDEO, which aim to select multidisciplinary people who can put creative solutions in unexpected situations, use this model. So, what is the T-shaped concept? The word meaning of the T-shaped concept, derived from the letter T, means having deep and extensive knowledge and skills. The horizontal part of the T-shaped, which gathers the qualities of people in two groups, expresses the extensiveness of knowledge in different areas, while the vertical part expresses the area of specialization. 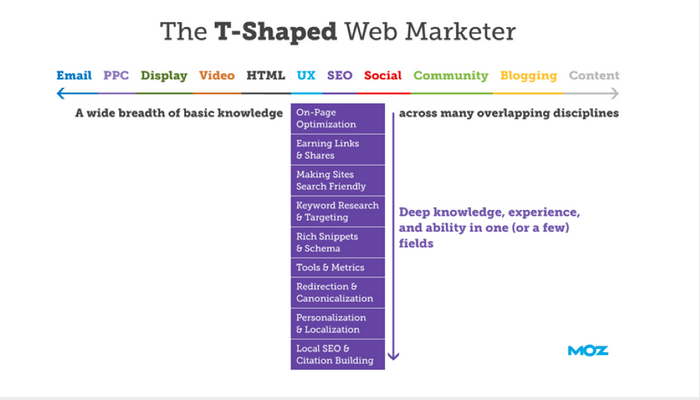 The above image, which I have quoted from Moz’s article “The T-shaped Web Marketer”, exemplifies the T-shaped concept nicely. While an online marketing specialist has a knowledge on various topics related to online marketing from design to content marketing, social media to e-mail marketing, he might be specialized on SEO. Thus, while he can master all aspects of his expertise, he can better understand current and potential problems with his knowledge in different branches and present more effective solutions. It is impossible for a person to deal with all these deeply and to create detailed solutions. At this point we can say that having profound knowledge about SEO enables us to create more comprehensive solutions, having knowledge on other areas related to the matter will have positive results in terms of cooperation. If the answer is “yes”, have you informed your teammates about this? How do you apply your knowledge to different areas? How do you use communication skills with your technical expertise? If the answer is “no”, then let us help you with some important tips to have a T-shaped profile. First, you must identify the focus point. And then, you have to develop yourself to have a lot of knowledge related to this. In which areas does your field of specialization and knowledge concentrate on? In which areas do you need to develop in terms of knowledge and skills? Let’s say you want to develop yourself in SEO. In this case, you can start with the trainings offered by internationally successful brands, attend to domestic and international events, and keep your research and learning motive alive. You do not have to be an expert on every subject, and it’s already quite impossible. Therefore, once you have identified your field of specialization, you should develop yourself in areas that are distant or close to your field of specialization. What we mean by development in here, rather than a profound knowledge, is “the ability to nurture the field of specialization with some other relevant fields and to create a certain point of view and provide effective solutions when there is a problem outside the field of specialization”. For someone who decides to specialize in SEO, our recommendation may be to nurture himself in the areas which he might encounter in SEO processes such as design, Google Analytics and GWT, basic knowledge of coding, and content marketing. Finally, we have a small recommendation for the agencies. A team of T-shaped people with different areas of specialization allows you to create more effective strategies and achieve the highest efficiency. Of course, you need to create a smooth communication and balance between the team members in order to achieve this.